Important note: A PayPal account is NOT required to purchase. The transaction is processed by PayPal's system but you do not need a PayPal account. If you click on "Buy Now" and then click on "Continue to PayPal" you will be given the option of simply using a credit card or debit card. This book is a follow-up to Mandolin Master Class and provides 84 pages of information and exercises to help you gain control over your fingers! Mandolin Master Class is about "what to play" and this book is about actually being able to do it! The exercises presented range from easy to extremely challenging. But, the exercises progress in an organized way to lead you to a better understanding of the fingerboard while building speed and dexterity. The book includes detailed micro-analysis of finger mechanics to help you find the most efficient way to execute passages on the mandolin. The book presents information on position shifting and plenty of exercises to develop that important skill. All of the exercises follow a consistent chord progression and the Audio Companion Tracks provides chord backup for all 12 major keys. A record keeping section allows you to track your progress with each exercise. 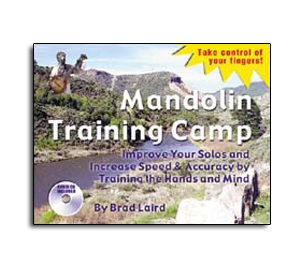 Mandolin Training Camp is a challenging and informative book which can elevate the skills of all mandolin players to new levels of expertise. Good for teachers to use as a supplement to teaching songs and chords. All exercises are presented in tablature. No reading of standard notation required. 84 pages.